Adisa Banjoko & Mike Relm @ The World Chess Hall of Fame May 8th! March 4, 2013 (St. Louis, MO) -- Look closely and you’ll see it at the beginning of the new Justin Timberlake video featuring Jay-Z. Read the lyrics of “General Principles” by GZA. Check out the album cover for Pawns in the Game, the 1990 album by Public Enemy emcee Professor Griff. It also shows up with RZA in scenes featuring hip hop characters on the hit TV show Californication. It’s chess. And at first glance, it doesn't appear to have a link to hip hop. Throw martial arts into the mix and you really have to have your finger on the pulse of popular culture to know about the connection. A group of national experts who really do know do “have their finger on the pulse” – and know the impact that this combination can have on young people – will meet in St. Louis on May 8 to present to students of the Innovative Concept Academy. A second session with local leaders will be held at the Schlafly Branch of the St. Louis Public Library. “These presentations will illustrate how chess and martial arts have been woven into the history of hip hop. Further, it will show how the blending of art, logic, and physical fitness guide young people to self-discovery, self-mastery, and nonviolence,” said Adisa Banjoko, journalist and founder of the Hip Hop Chess Federation. Banjoko, who has been tapped to present at institutions like Harvard University and Brown University, assembled the group and will moderate discussions. Panelists include Dr. James Peterson (founder of Hip Hop Scholars, LLC, and director of Africana studies at Lehigh University), Mike Relm Youtube video remix icon and co-founder of Bishop Chronicles podcast show, Asheru (Peabody Award-winning journalist, creator of The Boondocks theme song, educator, and youth activist), and Alan "Gumby" Marques (Black belt in jiu-jitu and founder of Heroes Martial Arts). The presentations are sponsored and coordinated by The World Chess Hall of Fame. “Our focus at the World Chess Hall of Fame is to show how the game of chess has an impact on society. The work of Adisa and the other panelists has been life-changing for many people. The examples they will share will show how this change can happen in St. Louis as well,” said Susan Barrett, executive director of the World Chess Hall of Fame. Adisa Banjoko is a respected journalist, lecturer and the founder of the Hip Hop Chess Federation. His organization has appeared in the New York Times, San Francisco Chronicle, Washington Post, and Vibe magazine. He’s also been a guest on NPR and Good Morning America. Dr. James Braxton Peterson (Duke ’93, UPENN 2003) is the Director of Africana Studies and Associate Professor of English at Lehigh University. He has been a visiting lecturer and preceptor in African American Studies at Princeton University and the Media Coordinator for the Harvard University Hip Hop Archive. He is also the founder of Hip Hop Scholars, LLC, an association of Hip Hop generational scholars dedicated to researching and developing the cultural and educational potential of Hip Hop, urban, and youth cultures. Mike Relm is a pioneer video remix artist who has toured with The Blue Man Group, Tony Hawk and rocked stages at Coachella, Bonnaroo and The House of Blues. He has more than 13 million hits on Youtube. Notable remixes include Iron Man 2, Old Spice, Scott Pilgrim Vs. The World,Doctor Who, and Harry Potter. His Punisher/Spirit/Transporter remix won the 2009 Webby Award for Best Mashup/Remix. Asheru, born Gabriel Benn, is a hip hop artist, educator, and youth activist. He is widely known for performing the opening and closing themes for the popular TV series, The Boondocks, as well as his pioneering and innovative efforts to forward the Hip Hop Education movement. Gumby is a second degree black belt in Jiu Jutsu and is best know as the co-founder of OTM, one of the world’s leading sources for Brazilian Jiu Jitsu. He is an author, commentator, coach, referee, and instructor. The World Chess Hall of Fame (WCHOF) is a nonprofit organization committed to building awareness for the cultural and artistic significance of chess. It opened on September 9, 2011, in St. Louis’s Central West End after moving from previous locations in New York and Miami. 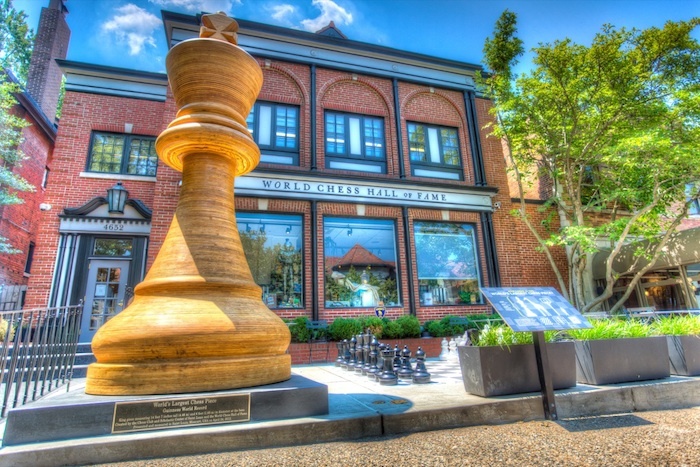 The WCHOF is housed in an historic 15,900 square-foot building that includes three floors of galleries, the U.S. and World Chess Halls of Fame, and the stylish Q Boutique. It provides visitors with a unique opportunity to use chess as a platform for learning, exploring, and seeing their world in entirely new ways. It is the only cultural institution of its kind in the world and the only solely chess-focused collecting institution in the U.S.
For more information, visit www.worldchesshof.org.